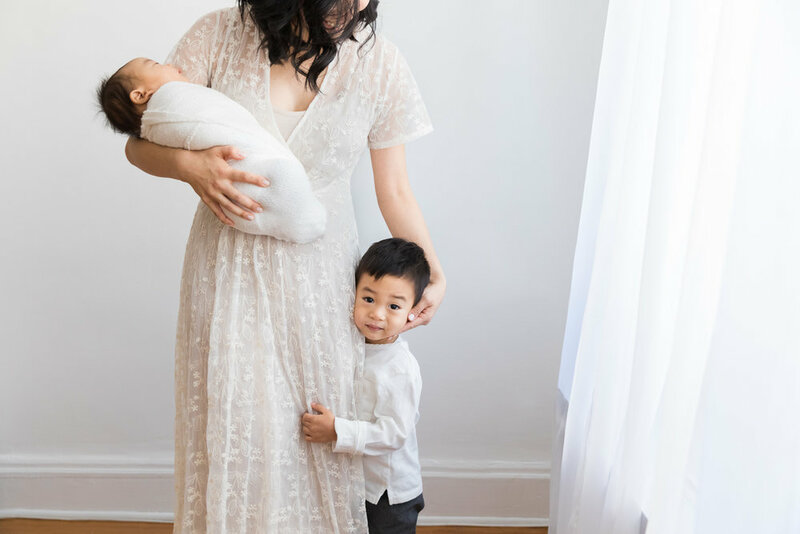 Clients often ask me “do you recommend a studio session or in home for our newborn family photos?” I’ve already discussed the pros and cons of in-home newborn session in your NYC apartment, but if you’re on the fence? Studio session, hands down. Why? There is no need to tidy the home; my studio is clean and uncluttered. There is no need to worry about whether you have enough light in your home (or if the weather will be good); my studio is bright with gorgeous natural light and if the weather is poor on your session date, I expertly use professional studio lights to bathe you and your family is beautiful light. There is no need to worry about coordinating outfits or whether your choices will photograph well; I have an extensive, gorgeous studio wardrobe, that all clients are free to browse prior to their session or the day of. They are timeless and look gorgeous on your walls. My studio is white and full of neutral colors, which allow the final portraits to focus on your little one, your family, and all your love. These images will look cohesive and beautiful in an album, and they will look just as gorgeous in your current home as anywhere you may live down the road. If you want an easy, breezy session day, a studio session is perfect because all you really have to do is show up and you are guaranteed beautiful portraits. I will discuss preparation tips when appropriate, send you well-timed reminders so you don’t forget the most important points, but otherwise, just come at our appointment time. I will help you feel beautiful and we will create honest, loving moments, artfully captured. What else do clients on the fence about location ask me about studio sessions? Lots. 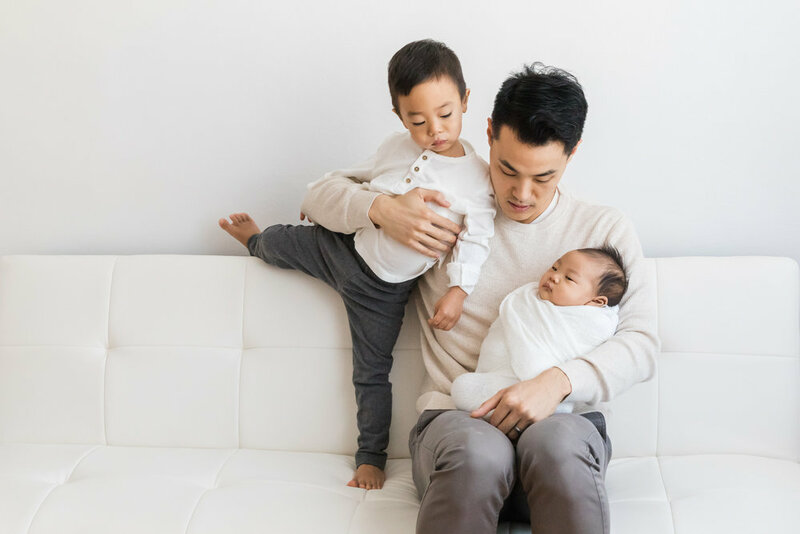 Here are a few of the most common questions when someone is considering bringing their newborn and family to my Upper West Side portrait studio. Some photographers have a strict timeline for when they will do a newborn session, but I am not one of them. Babies are beautiful at every age and stage. While newborn sessions (zero to three moths of age) often book up months in advance, I sometimes have availability for last minute sessions and you should absolutely inquire. Why do I consider zero to three months newborn? During that time, baby is still so small, sleeping often, and not fully aware of his or her surroundings. Not only does baby still look new during that time, baby still feels so new for the family, and that is what my portraits focus on. It really takes (at least) three months to settle into life with a new family member, right? 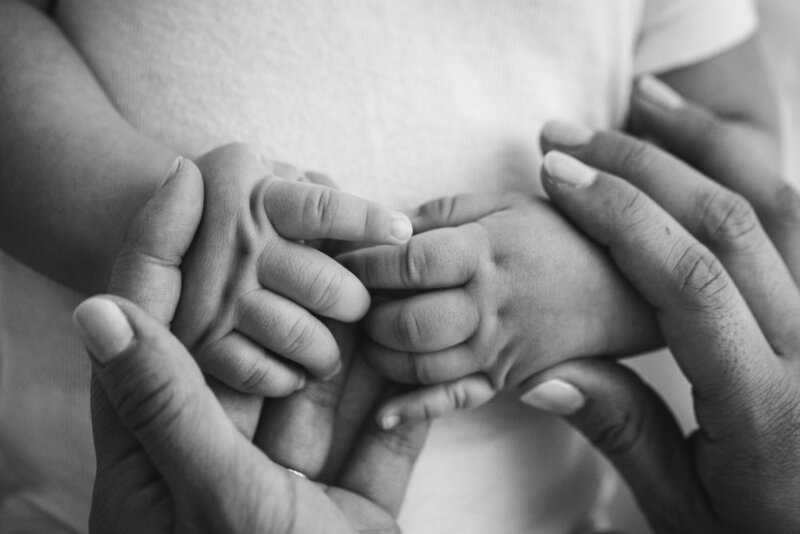 A newborn session should capture all of baby’s sweet details, but it should also capture the awe, excitement and love that come with welcoming a new baby into the family. Do I really need to come for an in person consultation? The short answer is of course not. However, if you are investing your time and money in quality portraits of your baby and family, I highly recommend coming by if you can. It makes session day better by establishing a connection between artist and client, and it makes your final product better by discussing ahead of time how you and your children will enjoy your portraits down the road. Also, it’s fun. Who doesn’t like looking through (or even trying on) dozens of beautiful dresses? I currently offer consultations on Fridays Saturday mornings; consultations are complementary and there is no obligation to book. I recently met Jen (and sweet Ezra!) at my Upper West Side studio for a fun, low key consultation. Jen browsed the Studio Wardrobe and found a lovely dress for her and great things for her husband and Ezra’s big brother, Jeremy, to wear during the session. There is nothing like holding my heirloom albums and seeing the fine art prints in person, and Jen loved seeing what I had to offer so she and her husband could take their time deciding what artwork would be right for them. What will studio newborn photos look like? They will be gorgeous. They will be full of light and love, and you will make one your profile picture (because you will look gorgeous in the light available in my studio and you will feel so beautiful in Studio Wardrobe.) My cozy studio is located in a classic pre-war Upper West Side residential building, and it has all the charming details you would expect, all of which make for beautiful images. For Jen’s session we opted for a natural light session focused on family portraits. Ezra was two months old at the time of his session and he did not sleep a wink! He did have a number of adorable, well timed yawns, but otherwise he was staring right into my camera or smiling ear to ear. Sibling photos of two year old Jeremy were also a priority, and we definitely managed to create some beautiful portraits of the brothers, one of which will soon be hanging in their home. Sweet, chunky Ezra! He is the stuff baby photographer dreams are made of. It’s impossible to choose favorite photos from this session, but I’ll do my best.